What do you get when you cross a great golden sun high in the bluest sky, hot sandy beaches that stretch as far as eye the can see, shaded beach bed to lay on and a delicious, freshly prepared refreshing cocktail?? Yes!! You guessed it. A bloody awesome day!! These beaches are most definitely not Bora Bora five star rated paradise-style beaches. This is also definitely not the pure Whitsunday Island beaches. 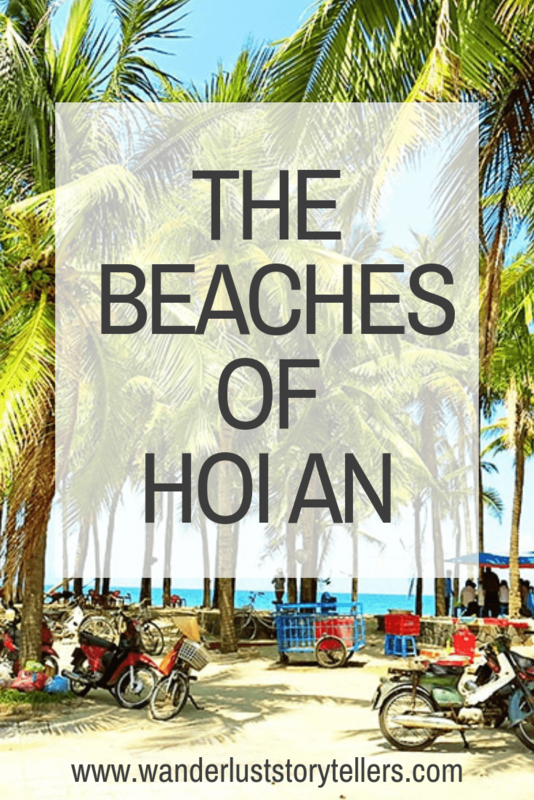 These are the beaches of Hoi An. 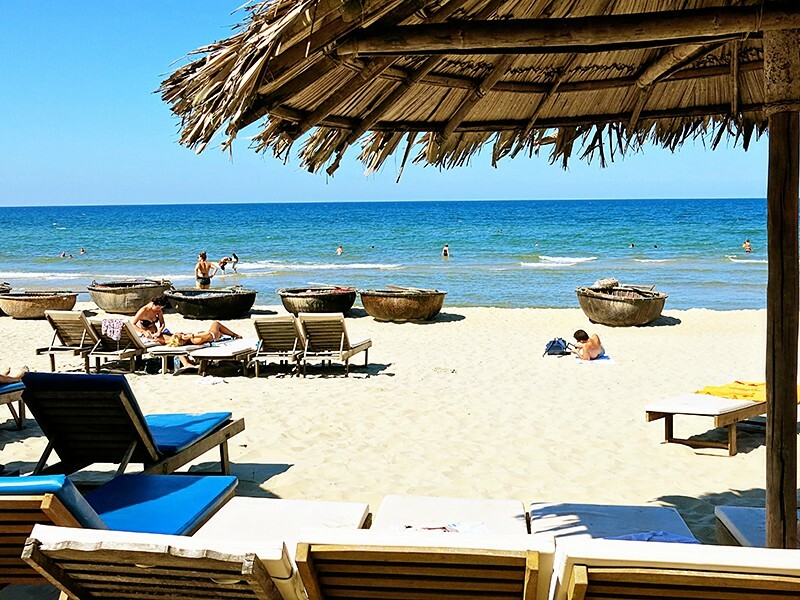 Just about 4 km from the center of the gorgeous Hoi An Ancient Town in Vietnam, you will find the Hoi An beaches of Cua Dai and An Bang. Imagine golden, fine sand covered beaches, all lined and filled with spectacular palm trees. These are two of our favourite little spots for both relaxation, cocktails and some fine local cuisine. 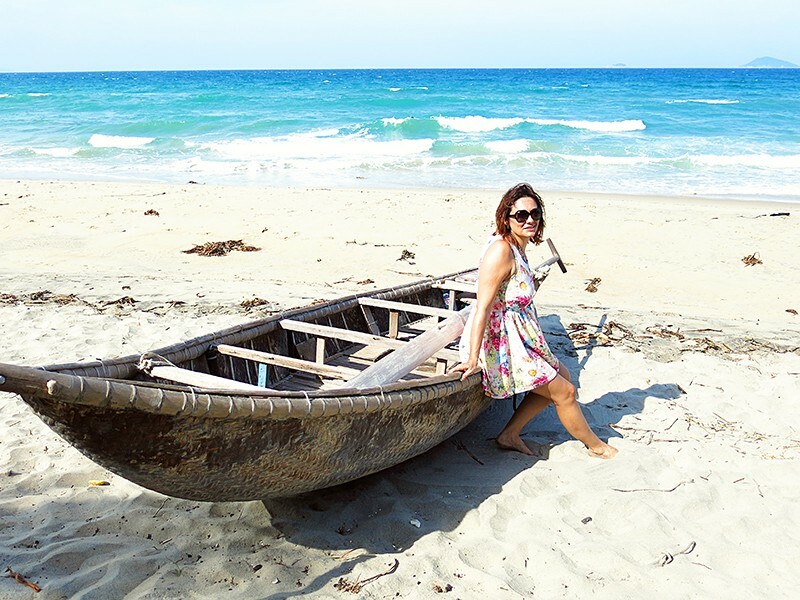 How to get from Danang to Hoi An. 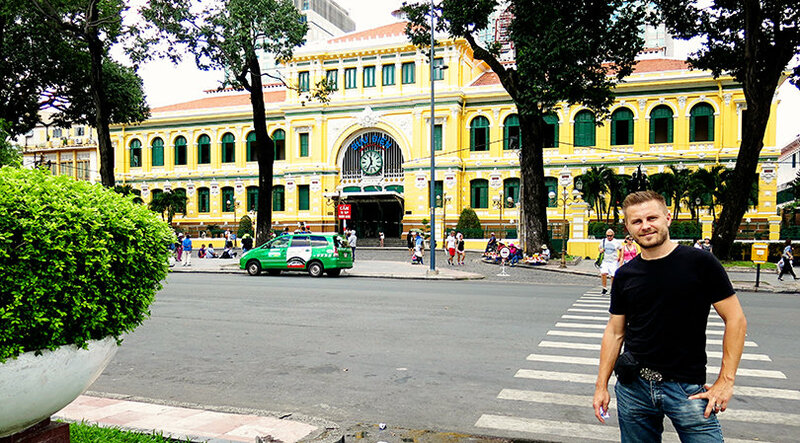 How to get from Hanoi to Hoi An. Here you will find exactly what you need, food, drinks and drinks and drinks, and plenty of it hahah. Yes, the vendors, restaurants and mini kitchens are everywhere, so you will have plenty to choose from. Do not settle for just any of the places. Go for a wander and find yourself a little piece of paradise to relax in. We started our beach exploration at Cu Dai Beach. 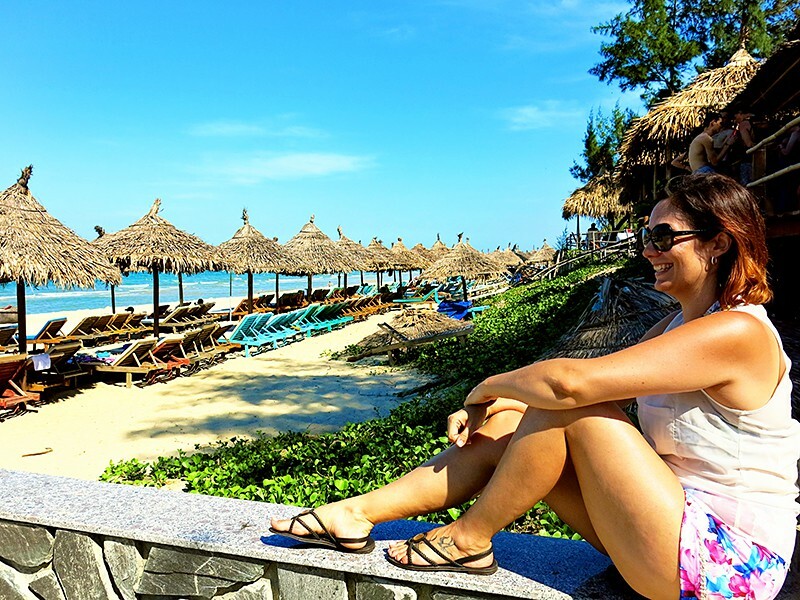 It was easy for us as we stayed at the awesome Victoria Hoi An Beach and Spa. 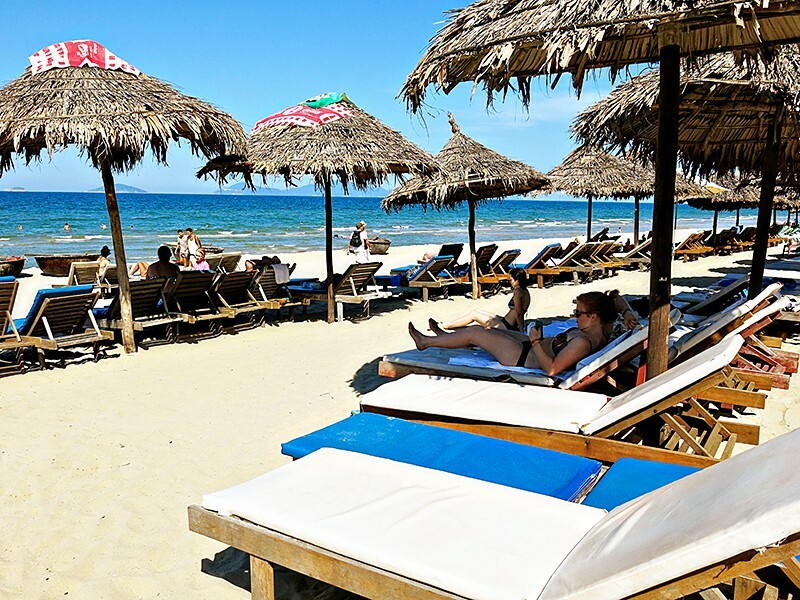 Cua Dai is the closest beach to Hoi An. This small part of the beach (as seen in the photo above) belongs to the resort that we stayed in and as you can see it is pretty bloody nice!! We were here at midday, so not many people were sharing the experience as it was ridiculously hot. The only way you could stand the heat was to hide under the shade, quickly!! As you jump to the other side of the resort (if you are staying here), you will find a different view. Yes, not as pretty as the previous picture. Well, being situated at this amazing part of the world, Cua Dai beach is (as the whole coastline here) affected by pretty constant erosion. Unfortunately, the typhoon a few years ago didn’t help the cause of protecting this piece of paradise. Don’t worry. 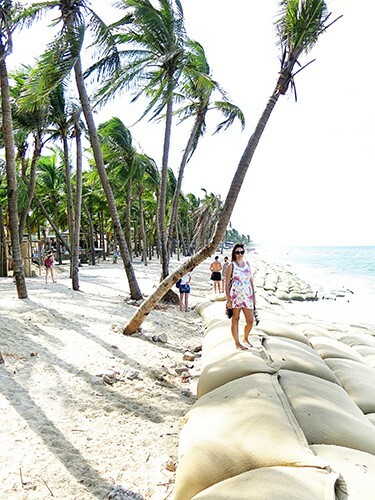 As you can see the locals, together with help from the local government, try to keep the sand controlled, leaving these beautiful sandbags on shore.. hahah.. I know, but still got the beautiful palm trees behind them!! You can literally pick and choose your own tree to sit under and relax if you please. 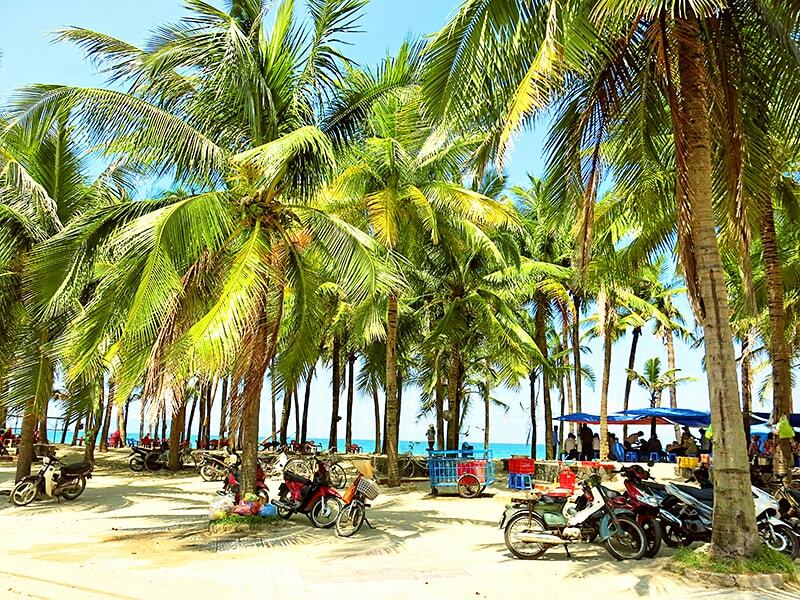 Plenty to see along the way as you walk north towards the An Bang Beach. You can find, scattered on the shoreline, traditional fishing boats. You can stumble upon a gorgeous girl relaxing with her feet in the sand.. Ohh.. That’s my wife.. Isn’t she gorgeous!! 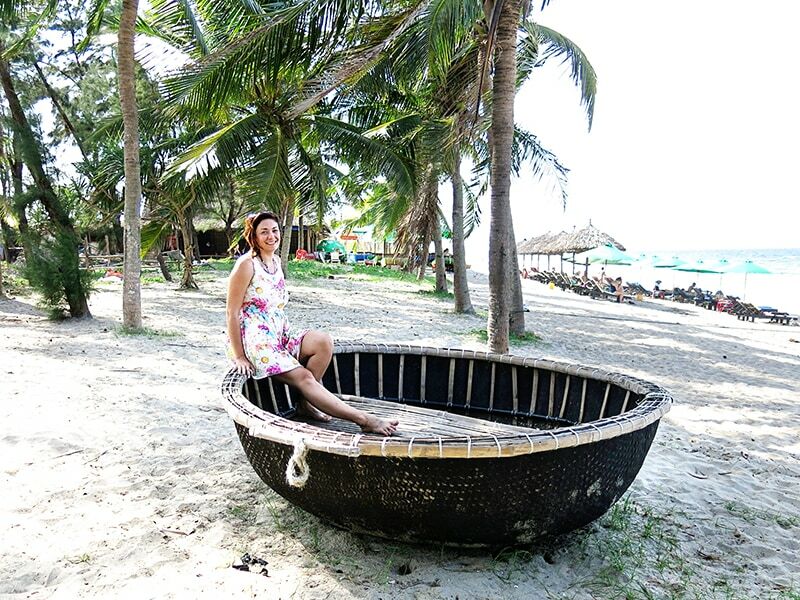 Or you can find a very cool lightweight woven bamboo basket traditional fishing boats. These are very interesting to us, as we come from Australia and these designs are not our traditional shape. To us, it looks more like a cool basket boat to take a trip on, not as a means to get food for the family. Anyway. Very funky little things and you simply must jump into one for a photo opportunity when here. 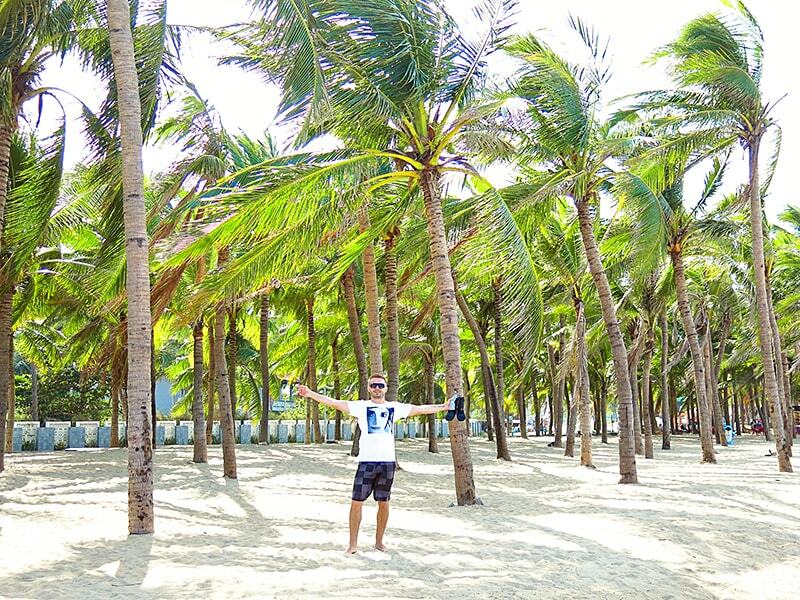 This very popular and very touristy stretch of the Hanoi Beach is called An Bang!! Now, this is what I call relaxation in style. No need for some fancy treatment. Here you simply need a bikini or board shorts, a wallet for some yummy cocktails and the smile on your face will appear by itself. I mean, really.. Do you need much more than that?? Beautiful and smiling at all your not-so-funny jokes girl next to you … check!! Cocktail in your hand.. Check!! I think that just speaks for itself. 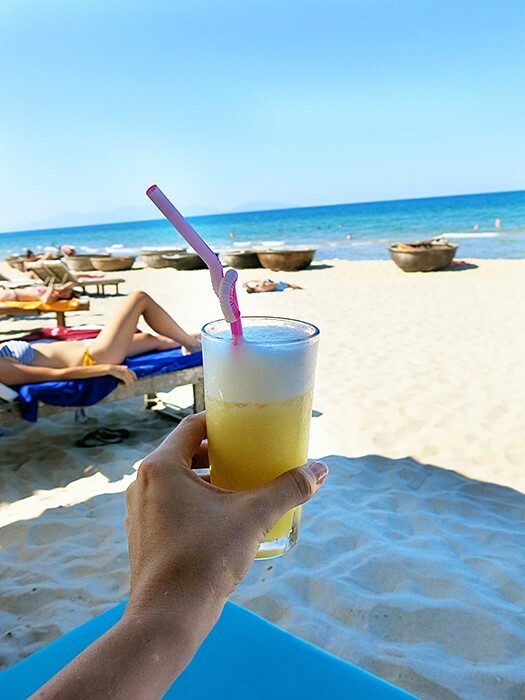 It is all good, when you are chilling out at one of the Hoi An Beaches. 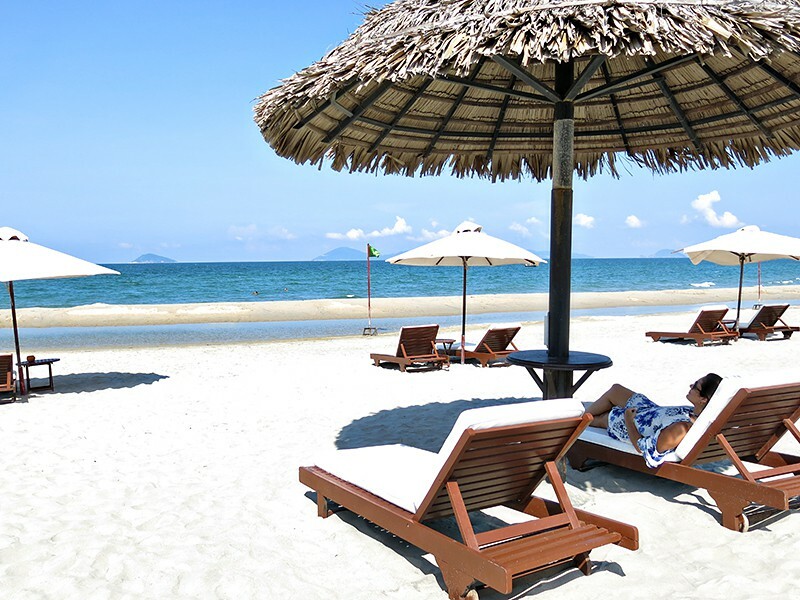 Whether it is Cua Dai or An Bang beach, choose for yourself. We think maybe the second of two. Just that little bit more relaxing and amongst some cool international visitors. 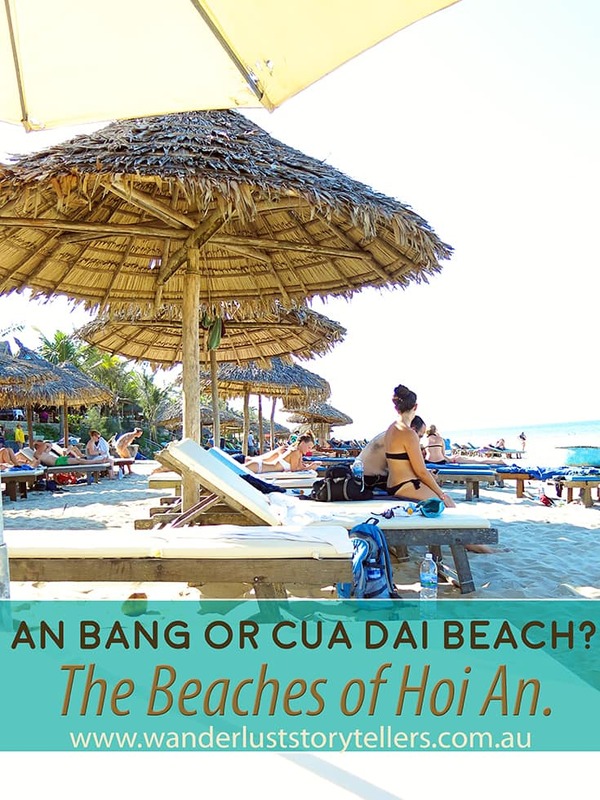 Which Hoi An Beach attracts you the most: Cua Dai or An Bang beach? What is the first cocktail that you will order when laying in the comfy beach chair? Please help us grow by pinning the image below!! YOU ARE AWESOME, THANK YOU!! 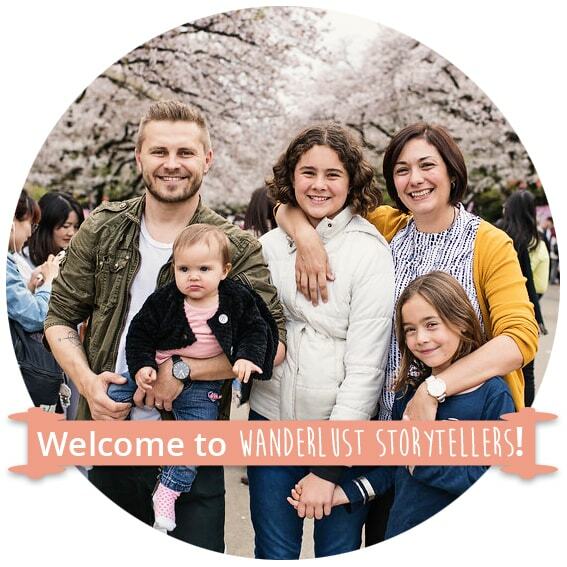 Be sure to follow us on our social media, so you never miss a post! 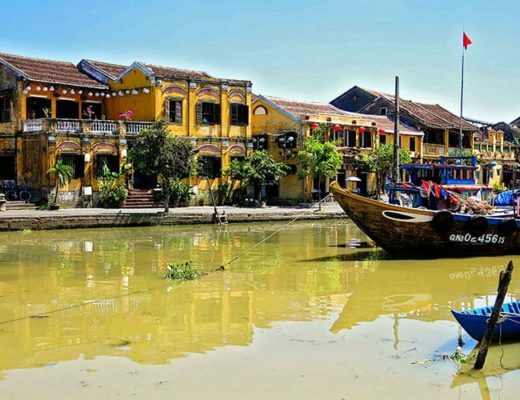 The Enchanting Ancient City of Lanterns in Vietnam – Hoi An Old Town! having vacation in Hoi An, visited An Bang beach and prices are twice up than you mentioned in your story. 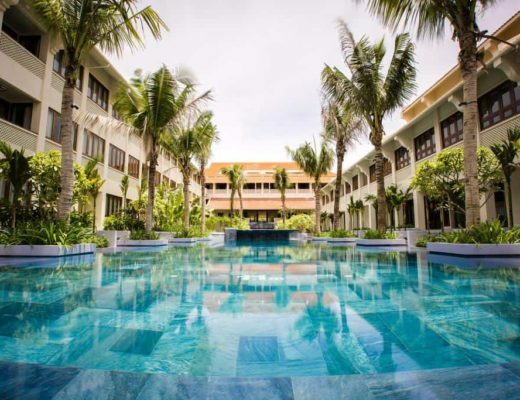 And I recommend Cua Dai beach – beach of Hoi An Beach resort – definitely is the best! no sand bags and waves are smaller than at An Bang beach.